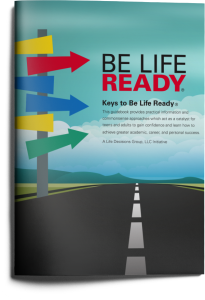 The purpose of the Be Life Ready Challenge is to promote and encourage individuals to either help themselves, or help others they care about, reach their full potential and increase their chances of achieving higher levels of academic, career, and personal success using commonsense approaches and practical information included in 9 Keys to Be Life Ready. Download the Be Life Ready Guidebook and spend time reviewing the content for each of the 9 Keys to Be Life Ready. View the 6-minute Introduction to Be Life Ready Video to learn how accepting the Be Life Ready Challenge can impact how you feel, what you think, what you do, who you could become, and how you could reach your full potential. If you answered yes, take positive action by printing and signing the Be Life Ready Pledge to show that you are making the commitment to accept responsibility and work hard to address the Keys to Be Life Ready and strive to reach your full potential. It’s your decision. It’s your life. The kind of life you have will be yours to decide. Accept the Be Life Ready Challenge to act as a catalyst for you to gain confidence to achieve greater academic, career, and personal success on your path to a more satisfying life. Accept the Be Life Ready Challenge. You’ll be glad you did! The Be Life Ready Challenge is not about asking people to donate money. It is about asking people to use the Be Life Ready initiative to serve as a catalyst to raise the hopes and dreams of thousands of teens and adults who desire to improve the quality of their lives. The focus of the Be Life Ready Challenge is for people throughout America to become actively involved in helping build stronger communities by donating their time, effort, and energy to provide encouragement and support for others who are striving to gain better control of their destiny by making life-impacting decisions that produce favorable outcomes leading to a happier, more successful life. Any individual or organization can play an important role in challenging others to accept the Be Life Ready Challenge. How Can Accepting the Be Life Ready Challenge Help Someone? Whether someone is a middle school, high school or college student choosing a field of study, or an adult searching for a better career or life, accepting the Be Life Ready Challenge can help them learn to overcome obstacles, gain confidence, create realistic academic and career plans, and understand how to address making life’s most important decisions that will have a significant impact on their level of satisfaction. The Be Life Ready Challenge can be used to address many of the most prominent social problems in America today. Thousands of teens and adults are in a period of transition trying to reevaluate their lives. Be Life Ready can help them gain their confidence and make decisions helping them to become more self-sufficient. Large groups such as veterans, immigrants, reformed prisoners, school dropouts, at-risk students, the unemployed or underemployed, and people living in poverty can all benefit by gaining information in the Keys to Be Life Ready. Help us count how many people are accepting the challenge. Help us count how many people are choosing to accept the Be Life Ready Challenge” and the second section said “If you are an individual accepting the challenge add yourself to the count by placing the number “1” in the box below and clicking the submit button, however if you facilitated a Be Life Ready presentation to a group of people in a school, church, or any youth, civic, or community organization*, place the total number of people in your group who accepted the challenge in the box below and click the submit button. 1,055 people have accepted the challenge! * If you are a representative from a school, church, or any youth, civic, or community organization who served as a Be Life Ready facilitator please send an email with the name of your organization along with the number of people who accepted the Be Life Ready Challenge. Please indicate in the email if you would like to be acknowledged on the Be Life Ready web page for supporting the Be Life Ready initiative.